A beautiful 442-foot waterfall in the Hamakua Coast area of the Big Island of Hawaii, ‘Akaka Falls carries Kolekole Stream to the rainforest floor below, and is a popular stop for tourists on the island. However, the many visitors might miss the most interesting part of the falls: the goby fish that literally climb up the wet rocks behind the falls to reach their spawning grounds. The northeastern coast of the Big Island is one of the wettest places on the planet, with the nearby city of Hilo receiving on average over 200 inches (5.1 meters) of rain a year. 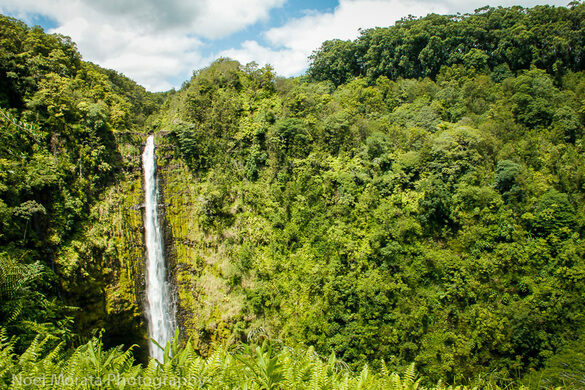 In the rainforest near the town of Honomu, ‘Akaka Falls State Park hosts a small loop trail that features views of the rainforest, culminating with the vista of ‘Akaka Falls with Kolekole Stream cascading 442 feet to the surface. While the descending water is an obvious nature attraction and well worth a visit in and of itself, sometimes things go up the rocks behind it. The less than three inch long goby fish called “o’opu alamao’o” (Lentipes concolor) live in the Pacific Ocean but spawn in the stream above the falls. The eggs are laid at the top of the falls and are washed back out to the ocean where they hatch and mature. When they are ready to procreate the fish head back to the falls and using a special sucker on their underside, they climb up the rocks behind the falls to start the cycle all over again. Lots of waterfalls hide caves, but this may be the only one that hides rock-climbing fish. Follow Akaka Falls Road, Highway 220, from Honomu, HI. Stop by some of the fruit stands along the way and enjoy some of the delicious fruit grown in the area. Hide from Hawaii's tourist hordes in these relatively unknown, and unguarded lava caves.